Dear readers, alas the reviews have taken a back foot due to real life, however rest assured your favourite reviewer is back and ready in 2016 to take a continued look at those NES games and confirm whether you should part your hard earned cash on them. The first game is one inspired by a review of the game on the wonderful SkirmishFrogs website and one that until very recently, was yet to grace this reviewer’s collection. 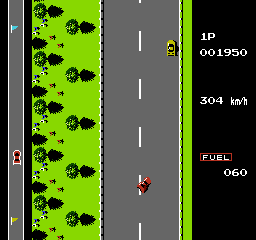 The game being one of Konami’s first car racing game that originally came out in 1984 in the arcades. Like a lot of early NES games, arcade games were ripe for porting onto the new home console, so how does today’s game Road Fighter stack up – is it worthy of gracing the console or a car-crash of a game? 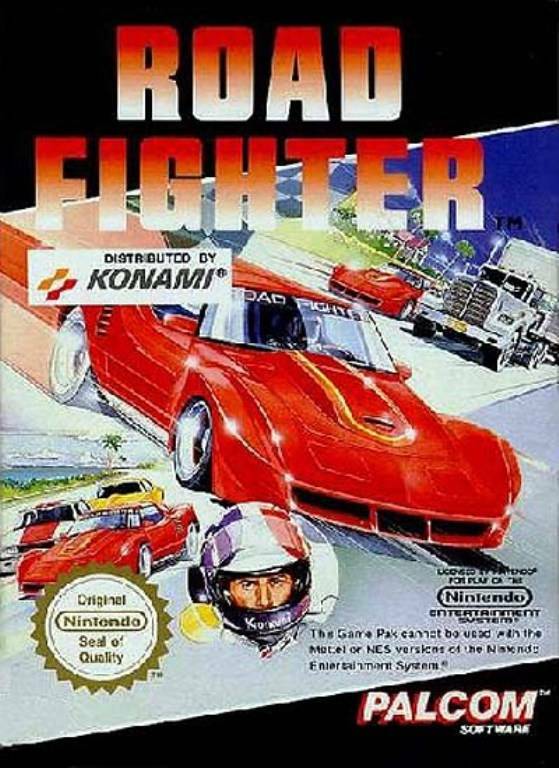 Released in Europe in 1991, a full 6 years after it’s release in Japan on the NES, Road Fighter as mentioned above is an arcade-style car racing game, in which you control your red coloured vehicle and overtake a number of cars in order to reach the goal within an alloted time. Sounds simple right? Well, aside from the speeds in which you travel at (more of that in a moment), on the road alongside you are crazy-assed drivers who change lanes and generally cause disruption so you don’t finish the level. Finish the race within the alloted time and you move onto the next stage, of which there are four courses ranging from grass-type levels to ocean-type levels, a real mixture. So how do you control the car? 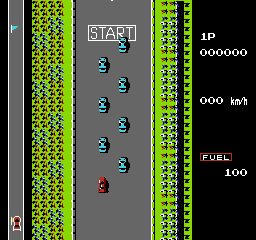 Well, pressing the B Button makes your car accelerate but only to a certain speed – on the NES version it is up to around 224km/h. So you may have the precision but it feels like you need more speed in order to get to the finish line quicker – well dear friends that is what the A button is for. With this you can travel up to 400 km/h but this does come at a price – you start off with a level of 100 and that gradually decreases. If you crash into another car or into the wall, you lose 5 units of your fuel. If the fuel counter goes down to zero, it’s game over. Trying to block your path to victory are different coloured cars – yellow cars travel in a straight line, blue and red cars change lanes and you may encounter trucks. If you see rainbow coloured cars, try to collect them whatever you do – they increase your fuel so it’s well worth attempting to collect them. Also on the track you may see oil spills so again try to avoid these because along side hitting other cars you’ll go spinning off the track, losing valuable time and fuel. The colours are bold and vibrant, easily differentiating between the different cars on the road and the background from the green grassy based levels to the seashore type levels. Although the detail is not great, the overall graphics are fine for the type of game you’re playing – you should be focussing on getting to the end of the level rather than admiring the view. The music is sparse and the sound effects can be quite jarring with the engine noise, especially with the continuous buzzing when you reach top speed. Yes it is nice that there is a sound effect for screeching brakes and the explosion when you crash into the wall but it is recommended to play this game with the sound off and the soothing sounds of thrash metal should ring in your ears instead. 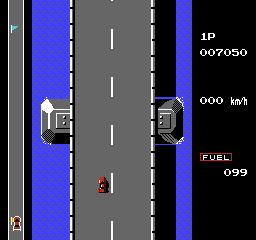 Road Fighter looks a good game, controls a good game and sounds…well like a game. However, the biggest problem with Road Fighter is the difficulty – there is no option for an easy/medium/hard difficulty but just one level – blooming difficult! 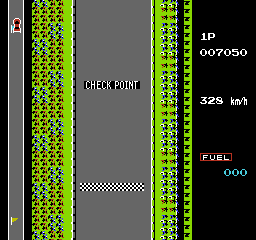 When you boot up the game you get the choice of Level 1 or Level 2, with the only difference is that level 2 is slightly harder with different coloured cars more plentiful then jsut the straight line yellow cars but still even without this, the game is difficult with a capital D. A challenge is one thing but Road Fighter can take the biscuit, and you’ll find yourself repeating the first level over and over and over again. With one life before it’s game over, you really need to have quick reflexes and good reactions in order to succeed in the game, but with that in mind is the pay off worth it? That’s down to you to decide, but really the game will cause more frustration then pleasure which is a real shame as the game looks good and controls well, but the steep difficulty will put off casual gamers. Copies are rare in the wild so unless you like a challenge, it may be worth side-stepping this one and picking up R.C Pro Am or Ivan Ironman Stewart instead. Take it from one who knows and has reviewed them….